eat run sail: Tap Water vs Bottled Water? What Do You Drink? Where do you stand on the bottled water vs tap water issue? Do you have good drinking water coming out of your taps, or do you have to filter it? Perhaps you prefer to buy bottled water to drink at home. We have been fortunate to always have lived where the tap water is of good quality. We have never even felt the need to use a tap filtration system. For years I have carried a water bottle with me, filled with tap water, and we never purchased water in plastic bottles until we bought the boat. As we got to know our cruising grounds better, we realized that many of the small islands that we were visiting didn't have good, clean water at their marinas, and so we would not use it to refill the boat's water tank. We were not about to foul it with unclean water... so our water supply was often nearly gone by the time we would arrive back at our dock, especially on longer cruises. We started purchasing and carrying water in plastic bottles, to be used in case of emergencies and as added 'insurance' on our cruises... but I always felt a bit guilty about it. Now that we are not doing longer cruises, we are no longer buying bottled water and I have been searching for a new water bottle for my daily outings. And I found a beauty! Actually, a couple of them. I was recently offered the opportunity to try out some new WENGER Eco Bottles and I jumped at the chance. I really liked the sound of them in the promo material. I have been using one or the other of my new WENGER Eco Bottle for the past few days and I just love them. They are made from virgin aluminum and have BPA-free liners. And they contain no toxins or other harmful chemicals. The mouth of the bottle is wide enough to pop a few ice cubes inside and off I go! These bottles do come in other colors and have an assortment of accessories such as carrying pouches, wrist straps, and cleaning brushes. And, replacement tops are available. Both of the bottles are a good fit in my hands. That makes them easy and comfortable to use. And both of these lid styles are easy to attach to a belt or bag or even a back pack. They fit bicycle water holders and also my running water belt. And because they are aluminum the cold water tends to stay cold a bit longer than in a plastic bottle, too. 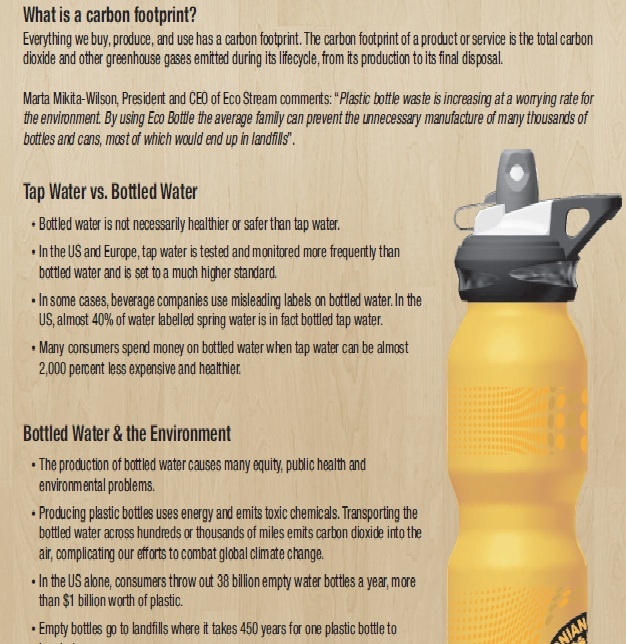 Here is what Eco Bottle has to say about their products. "Wenger by Eco Bottle is the newest innovation in wide mouth bottle functionality with a leak proof, triple lock system that is fast to close with only half a turn. In addition there are 4 interchangeable tops to accommodate everyone’s needs. These innovative, aesthetically appealing bottles are recyclable at the end of their lifecycle. Wenger by Eco Bottle has just launched in Canada at London Drugs." I was delighted to see that they are so reasonably priced. The smaller bottle is $14.99 Canadian and the larger is $19.99 Canadian. I know that some of the other bottles I have considered were much more than that. And to add to the fun, there is a contest. The blogger who generates the most clicks will win a “Go Green Fizz” Starter Kit and Sodamix Variety 12-pack by SodaStream ($212.00 value!). Just CLICK HERE if you want to help me out! I was given these water bottles in order to review them but the opinions expressed are 100% my own. Do you use tap water/filtered tap water or do you purchase water? Do you use a portable water bottle? What material is it? We use our tap water because we have well water that we've have tested several times (with excellent results). I tried clicking on the link for you but it doesn't take me to the contest? Unfortunately, where I live, I have to filter my tap water. We keep a Brita pitcher in our fridge, but we also usually have bottled water on-hand as well for those grab-and-go moments! I also use tap water that's filtered through my fridge dispenser. I have a Brita water bottle that's plastic with the built-in filter. I like the look of the Wenger bottles and that they're aluminum. I *never* drink straight tap water. Living on Maui, we always had fresh Spring or Purified water and now with the severe health issues my family is fighting we decided it was pertinent to get a Life Ionizer. This "water machine" not only filters the tap water from your faucet, but it allows you to control the pH balance in the water you drink. The higher the level, the higher the Alkaline, and the more beneficial it is for your body. My thirst is actually quenched when I drink this water, and it's literally filled with the minerals my body craves and would otherwise not receive. I have noticed a huge difference in my complexion, and overall vitality -- which is huge for me to notice because I swear my body is made of steal (ha! ), so I know it's the water (on top of all the other changes I've done; ie food etc). we drink bottled water. but use the big bottles and fill up our container like the Wenger. Our tap is just not good. Those do look like nice bottles. I am totally tap water. Why pay for what I can get for free? Your bottles look really nice. i use water in bottles. i'm probably killing the earth. I have always drank tap water. In fact, when I was growing up, it came directly out of the stream and we would drink from the creek all the time. Now, it's chlorinated and doesn't taste quite as good, but it's still just fine! I have been lucky in that aspect as well. The water from San Francisco comes from the Hetch Hetchy reservoir, which is in Yosemite, so it's REALLY good too!